Insulin is a hormone produced in the pancreas which helps to regulate glucose levels in the body. Insulin is one of the most powerful anabolic agents. Used properly, it can add weight to you more quickly than any other compound at our disposal. Used improperly, insulin will kill you. Insulin is not an androgen, or a steroid for that matter. Insulin is a proteinaceous hormone that is secreted from the pancreas, mostly in response to high sugar levels. It's a polypeptide made from 51 amino acids, separated in an A and B chain by a sulfide bridge (Covalent bond). Its main use is to regulate blood sugar levels. If blood sugar levels are too high insulin is released, which stores more glucose in the cells as the polysaccharide glycogen, the prime energy source in the human body. This alone makes it a valuable hormone. But it also increases the uptake of other compounds into the cell. This includes protein. Since anabolic steroids increase protein synthesis, and we eat lots of protein, the only thing missing in that system is a way to get the amino acids to where the protein is synthesized. Insulin can do that. Its interesting to note that insulin does not have a direct negative feedback system like steroids do. When blood sugar levels drop, cells simply become more resistant to the insulin and don't receive as much of an impulse to store glycogen as they would at first. This is important, as it will have certain implications. Insulin was designed for diabetics, a disease marked by one characteristic: too much blood sugar due to an insulin deficiency. There are two types of diabetics, but this is irrelevant to the discussion at hand. As with anabolic androgenic steroids, taking endogenous insulin will shut down natural pancreatic secretion action. This is not as easily solved as with steroids, where production eventually bounces back. Warning number 1 : Insulin use can, and in the long run will, make you a life-time diabetic. Keep that in mind before you decide that insulin might be for you. On the one hand this is a good way to get a discount maybe, on the other hand, injecting daily for the rest of your life is not a pleasant outlook. On second thought scratch that, there is no positive side as insulin is available freely without prescription at a fairly low cost. This is because when a diabetic does not get his insulin in time it may be fatal. When a diabetic goes into seizure you don't want to waste time going to a doctor to quickly obtain a prescription. By then its too late. There are three types of non-prescription insulin. Fast-acting, which is mostly used, known as Humulin-R. Then there is an intermediate form (Humulin-N or Humulin-L) which can last almost three times as long, which means up to a day. And lastly there is the Humulin-U, which stays active for longer. Particularly useful for diabetics who may forget their shots, as it stays active longer than a day. There is also a really fast-acting form called Humalog, but this is only available via prescription since it's the most easily abused and the Humulin-R suffices for most diabetics. 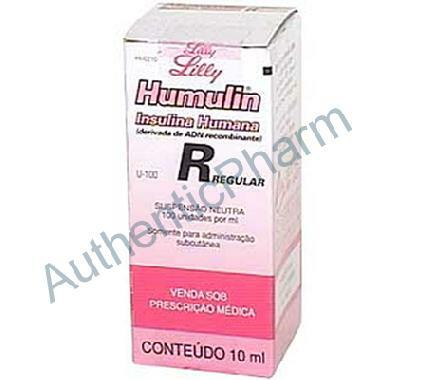 Humulin-R is the compound most used by the way because it's the shortest acting form. Yes, that's a good thing. In fact it's a very good thing. When administering supra-physiological doses of insulin, more glucose is stored as glycogen resulting in a lower blood sugar level. When your blood sugar level is too low, its called hypoglycemia and it can cause you to go into shock and die. Warning number 2 : If proper protocol for using insulin is not followed, you can die. This has two definite implications. First of all it explains why you want the short-acting form. Blood sugar levels need to be monitored over the active time, so you obviously don't want it to stay active for 24 hours or longer. The second implication is that obviously sugar has to be taken with the insulin to prevent hypoglycemia and sugar needs to be kept on hand for the entire duration of activity, which is 6-8 hours. If dizziness or weakness occurs, more sugar has to be taken. This will be discussed in the how to use section. Initially, doses of insulin will make you leaner as you store more carbs that would otherwise be stored as fat. But as people will tell you, it eventually has a tendency to make you fat. As indicated earlier, there is no negative feedback, but cells develop a resistance to insulin, in which case circulating excess carbs will be processed as adipose tissue. And if you know what's good for you, you will have circulating extra carbs. Stacking and Use: Insulin is obviously best stacked with some form of anabolic androgenic steroid. Its mostly added to stacks including the extremely expensive human growth hormone. Its proper use entails a single shot once a day of a short-acting compound. Usually Humulin-R, unless Humalog can be obtained. Its best used after a training session, when the body already has a tendency to store more carbs and protein. Although some people prefer other times of day. The standard protocol suggests the use of 1 IU per 20 pounds of bodyweight, but you would do best to start out at a lower dose like 2-4 IU and then work your way up a bit, until you feel you are taking enough. As doses increase, so does the amount of sugar that is ingested with them. Again a standard of 10 grams per IU is given, but I would recommend a dose of 150 grams regardless of the amount as long as it is below 15 IU's, if it is higher then add 10 grams for every IU. Since the compound stays active for 6-8 hours, hypoglycemia can occur at any moment during this time span. So consuming carbs during this time is advised, and at the very least keep a large amount of them handy, so you can act quickly. Dizziness, weakness and feeling sleepy are all pretty indicative of the onset of hypoglycemia and a good sign that you should take another good dose of sugar. The carb source suggested here should be glucose (dextrose). This is basically blood sugar and will absorb the fastest, minimizing the risk as opposed to other carbs. Mix 150 grams in water and consume within 20 minutes of the injection and keep a glass with another 150 grams handy. If you finish the glass, immediately prepare another until the insulin has cleared the blood. Again a reminder of the high risk involved with insulin. It can make you a life-long diabetic and in the worst case, it can kill you. I strongly advise against the use of insulin compounds. Should you not heed the warning, follow the protocol to the letter. One slip could mean your life.